Several Agape students placed very highly in the New York Urban Debate tournament. Manhasset, NY - November 25, 2013 - Recently, the Agape Debate Institute located in Manhasset, Long Island made the trip to New York City for the first New York Urban Debate tournament of the year, for high school students. Agape Debaters saw success in the High School division in policy debate. Agape debaters won the top two honors: 1st place winners Sameh Ahsan (Herricks H.S.) and Brandyn Chan (Great Neck South) 2nd place winners Bradford Lin (Great Neck North), and Nicholas Leung (Great Hollow M.S.) In the individual speaker’s category, William Jin (R.C. Murphy M.S.) received 3rd place speaker honors and Grace Zhao (Ward Melville H.S.) received 5th place. In addition to the success of these top medal winners, other debaters include: Arianna Pahlavan (Jericho M.S. ), Emily Xu (R.C. Murphy M.S. ), Regina Kim (Schreiber H.S. ), Ava Zhang (Great Neck South), Kathy Whang (Smithtown H.S. West), Jennifer Yang (Ward Melville), and from New Jersey, Priscilla Huh (Ridgewood H.S. ), Brian Lee (Bergen County Academy), all performed in outstanding fashion and competing against the top high schools in the New York. The Agape Debate Institute, which has locations throughout the tri-state area, provides excellent instruction in all forms of debate and in public speaking to students from all over Long Island, New York City, Connecticut, and Northern and Central New Jersey. Please visit our website at www.agapeleaders.com or email us at agapeconsulting@gmail.com. 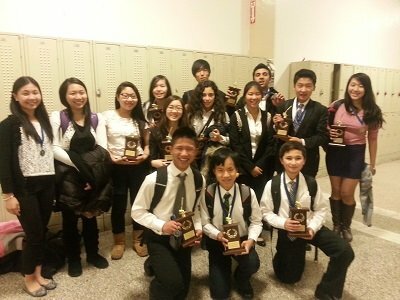 Subject: LongIsland.com - Your Name sent you Article details of "Agape Debate Institute Takes Top Honors in NY Tournament"